Steven (Chicagoland, United States) on 13 April 2017 in Plant & Nature and Portfolio. Calla Lily spotted at the Garfield Park Conservatory. I love how the lily appears as if it is illuminated from within and highlighting its veining detail. Wonderful !! Superb capture in a great light and color of background ! Superbe et lumineuse à souhait compliments ! Excellent image !!!! What a superb shot !!! Beautiful flower and dark background. A flower of great simplicity, portrayed with a beautiful light, and in which the background also deserves prominence and positive mention. Just magnificent. I really like the background in this image. Thank you for this beautiful flower! 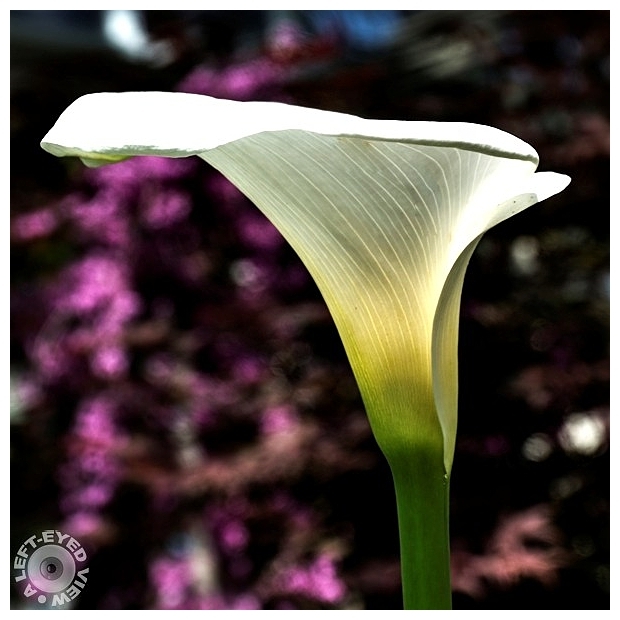 Calla lilies are among my favourites! Quelle plant et effet fantasitique rendu et vue. Like a glass about to be filled by a good wine ...! This is fabulous! The light through the flower is so sweet. Really gorgeous, Steven...I like the linear/soft feel to this piece! delightful bloom; very interesting background, though the bright spots at the edge near 11 o'clock and 4 o'clock could be toned down to eliminate distractions. Lovely light coming in there. Merci pour tes passages en mon absence. Belle finesse du détail pour ce calice magnifique. Beautiful light filling the cup - you were wise to get underneath it!